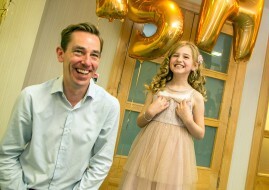 Ryan Tubridy presents the Late Late Toy Show on RTE. Some Irish Christmas traditions remain, despite the recession, and now expats and their families can share in the experience online. The Late Late Toy Show on RTE traditionally marks the beginning of the Christmas season in Ireland. For young, and not-so-young people who grew up in Ireland, the Toy Show is as much a part of the Christmas tradition as the lights on Grafton St or midnight Mass. But now viewers in Australia can enjoy the show via the RTE online player. To get you in the mood, check out this clip featuring Robbie Keane and his biggest fan, eight-year-old Domhnall.